Staying invested for long-term growth can help you keep up with inflation. Adjust your retirement income strategy to withstand changes in the markets. Longer lives provide more flexibility in investing. Staying the course with a plan for long-term investment can pay off over time. If you are in retirement or near retirement, it may be tempting to place your savings into low-return conservative investments. However, you should also consider the risk that you may outlive your assets or that your assets will not keep pace with inflation. When you are further away from retirement, time is your most powerful asset. It may be tempting to pull out of the market if you need extra cash or when the market is shaky, but being out of the market can cause you to miss valuable opportunities if stocks should rise. Inflation has been a consistent fact of life in our economy. While the inflation rate varies from year to year, since the mid-1980s it has hovered in the 2%-4% range. An inflation rate of 3% may not seem like a big deal, but over 20 years it would raise the price of a $.42 postage stamp to $.76. How would it increase more expensive purchases? A $1,000 refrigerator would cost a little over $1,800. A $23,000 car would sell for $41,540. The longer you live, the more these kinds of price increases could affect your retirement lifestyle choices — unless your investment portfolio is designed to keep up with inflation. Even at a moderate 3% rate, inflation can cut the purchasing power of your retirement savings almost in half over 20 years. If you're entirely invested in cash and short-term investments, these assets are likely to shrink in "real" value during a long retirement. By comparison, stocks have historically outpaced inflation and provided strong returns over the long term. If you are concerned about losses in the stock market, there may be ways to adjust your asset allocation so that your overall portfolio is somewhat less volatile — without giving up all of its growth potential. A 65-year old man can expect to live, on average, to 84.3. A 65-year old woman can expect to live, on average, until age 86.6. About one out of every four 65-year-olds today will live past age 90, and one out of 10 will live past age 95. Longevity trends suggest that these remarkable numbers will continue to rise. Your total investment time horizon is longer than you may have thought. Depending on your age today, you could be creating and managing an investment strategy for 20 years or more. It pays to stay with long-term investments. History shows that the markets have bounced back after losing value and it's likely this will happen again should major dips occur in the future. As the chart below shows, missing even a handful of days can have a long-term impact on your savings. 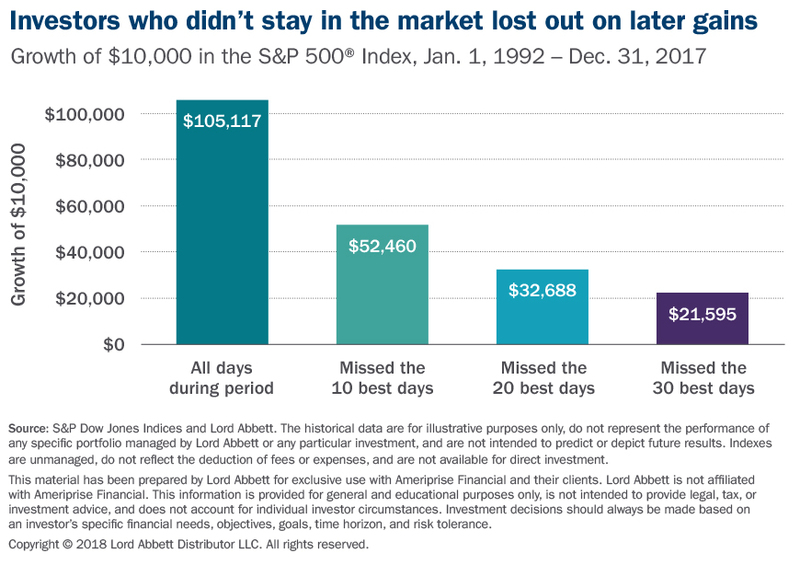 The graph below, from our partner Lord Abbett, shows how a hypothetical $10,000 in the S&P 500 index would have been affected by missing the market's top-performing days over the 25-year period from January 1, 1992 to December 31, 2017, which consists of over 6,000 trading days2. History is on the side of investors with a long-term investment approach. Volatile markets are a fact of life — as are market recoveries. Be patient and stay invested. Markets tend to bounce back from downturns, typically with a healthy revival. An Ameriprise financial advisor can help you define and create a strategy to give you the best chance for long-term success. 2 A Note about Risk: The value of investments in equity securities will fluctuate in response to general economic conditions and to changes in the prospects of particular companies and/or sectors in the economy. While growth stocks are subject to the daily ups and downs of the stock market, their long-term potential as well as their volatility can be substantial. Value investing involves the risk that the market may not recognize that securities are undervalued, and they may not appreciate as anticipated. Smaller companies tend to be more volatile and less liquid than larger companies. Small cap companies may also have more limited product lines, markets, or financial resources and typically experience a higher risk of failure than large cap companies. The value of an investment in fixed-income securities will change as interest rates fluctuate and in response to market movements. As interest rates f all, the prices of debt securities tend to rise. As rates rise, prices tend to fall. The S&P 500 Index is widely regarded as the standard f or measuring large cap U.S. stock market performance and includes a representative sample of leading companies in leading industries. Indexes are unmanaged, do not reflect deduction of fees and expenses and are not available for direct investment. The information provided herein is not directed at any investor or category of investors and is provided solely as general information about our products and services and to otherwise provide general investment education. No information contained herein should be regarded as a suggestion to engage in or ref rain from any investment-related course of action as Lord, Abbett & Co LLC (and its affiliates, “Lord Abbett”) is not undertaking to provide impartial investment advice, act as an impartial adviser, or give advice in a fiduciary capacity with respect to the materials presented herein. If you are an individual retirement investor, contact your financial advisor or other non-Lord Abbett fiduciary about whether any given investment idea, strategy, product, or service described herein may be appropriate for your circumstances. The material is not intended to be relied upon as a forecast, research, or investment advice, is not a recommendation or offer to buy or sell any securities or to adopt any investment strategy, and is not intended to predict or depict the performance of any investment. Readers should not assume that investments in companies, securities, sectors, and/or markets described were or will be profitable. Investing involves risk, including possible loss of principal. This document is prepared based on the information Lord Abbett deems reliable; however, Lord Abbett does not warrant the accuracy and completeness of the information. Investors should consult with a financial advisor prior to making an investment decision. Neither asset allocation nor diversification can assure a profit or protect against loss.